Getting fiverr gig ideas can be a bit tasking. And even though fiverr is a fast growing market with thousands of gigs, there are still certain gigs that are in high demand and the market is small. So to get the best out of your fiverr gig, it would be wise to focus on these gigs which have high demand and a thing supply. By the way, what’s fiverr? 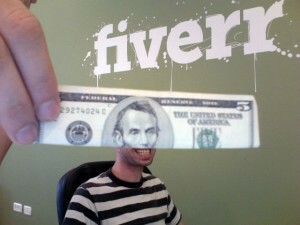 well fiverr is a market place where you get things you want such as programming, graphics, etc for $5. What ever it is you need from programming to fun and bizarre, fiverr has it all. I personally buy loads of gigs on fiverr and sometimes even contract the person for a long term job at a cheaper price. Now in all the buying and selling I do on fiverr (yes, I sell things there too), I noticed the gigs I am about to mention had the highest purchase and only a handful and providing some of them. If you want to start using fiverr, I recommend you add this one to the list of gig you wish to open. Some of these require you to have a skill of some sort, while others are just fun and easy. video is very lucrative, with various online markets springing up every day, the demand for testimonial video about their products and service is high, so if you have a camera and pretty face, getting such task done for people would help make some nice money. Offering to write seo optimized blog post sells fast on fiverr, all you need is a few sales with good reviews and you’d have hundreds of order in queue in no time. If you know a thing or two about search engine optimization, offering a gig on seo would attract buyers because they would find it cheap and affordable compared to expensive seo service. Google translation is not close to perfect in anyway, so if you can speak and write in two popular languages, offering a fiverr gig on translation would attract buyers. We’re in the DIY era; people like to get their web design issue fix without paying for an expert, simple because it’s too expensive to hire an expert, offering such service for $5 would attract buyers. If you’re a good reader and notice errors in a write up easily, you can offer to help people proof-read their books, articles and web contents and online publication for a fee . People want their voice heard, the want to have huge twitter followers, if you have the skills, selling a gig on twitter likes is hot cake, once you can deliver as promised, you’d make more than $100 per week. Promoting products through videos uploaded on YouTube is becoming popular, if you have the right software, you can offer to help direct traffic to their YouTube video and make it popular. Bizarre, but very profitable, if you have a little design skill, and fairly beautiful face, you can offer to write short message on your cheek for $5, messages like “I love you”, “Thank you” e.t.c. This requires some level of expertise, you should be able to use Photoshop or any other popular photo editing software and you can make as much logo as you want per day, once you’re creative enough. If you have a poetic talent, writing short love poem isn’t a bad idea, you can diversify by offering to write on toast word, love poem and common eulogy. If you have a way of directing huge traffic to a particular url, then offering a fiverr gig would help you get buyers attention, it doesn’t matter if the traffic is targeted of not. Some people would offer to dress like Jesus and create a video for you, or like a boogie man and give a testimonial. Some even chooses to dance in a masquerade attire for a fee lolz. Recording a happy/sad birthday song for people can earn you some $$$ on fiverr. Directing people to like a particular Facebook page either by direct referrals or by the use of automated services can get you a good number of willing buyers from fiverr, thereby creating a good passive income for you. There are hundreds of best fiverr gig ideas out there. So use the comment box below to share other Fiverr gig ideas that brings ton of buyers in seconds. This will help everyone else improve on their Fiverr freelancing and/or marketing services. I’m writing an article for our blog on everything that you can get done on Fiverr for a small business. Wondering if you might like to contribute and would love to link back to your site as well. Kyle will get back to you once he’s back from Vac. do you mind to share these unique ideas ?